The Coca Cola Zero Belfast Bikes scheme celebrates its first birthday, following a successful year that saw the people of Belfast take Northern Ireland’s flagship public bike scheme to their hearts. Since the initiative was launched on 27 April last year, usage has grown steadily with more than 191,000 journeys undertaken by the scheme’s 6,000 annual and casual users. The bikes have travelled estimated 174,000 km – a distance equal to four times the circumference of the Earth. There are currently 33 docking stations and 330 bikes, available for hire 365 days a year, from 6am until midnight. Further expansion is planned this year to three hospital sites and eight community areas. Stations at the City and Royal hospitals are due to be installed in late May, with the other stations scheduled for installation later in the summer. The Council is developing a strategic plan for further expansion of the scheme. Andrew Grieve from the Department for Regional Development Cycling Unit hopes that ongoing and future work to dedicated cycling infrastructure will encourage more Belfast Bikes use. Gordon Clarke, Director of Sustrans Northern Ireland which was involved in delivering on-road cycle training to new subscribers in 2015 hopes the scheme will go from strength to strength. “We are delighted with the success of the Belfast Bikes which shows the appetite there is in the city and beyond for cycling. Belfast City Council and the DRD are to be commended for this visionary initiative which has certainly created a better place for people to work, live and move in. Declaration of interest – I am a paid-up annual subscriber and a huge fan of Belfast Bikes. As a daily cycle commuter I use Belfast Bikes primarily as a way to shuttle around the city at lunchtime, or occasionally for meetings elsewhere in the city. £20 for a year compares very favourably with gym membership..
It’s worth repeating the point that 191,000 journeys is a phenomenal success. 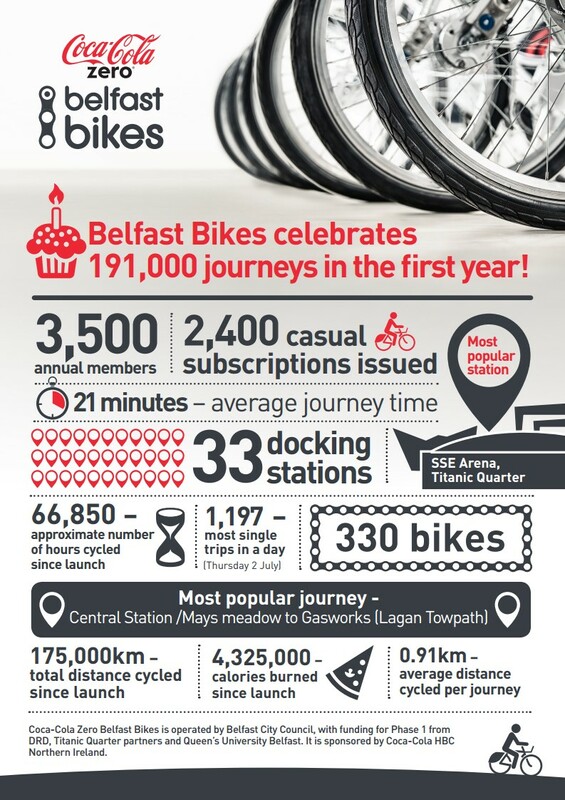 In six months Belfast recorded 100,00 journeys, compared to Glasgow taking 14 months from launch to do the same, with more bikes, stations and subscribers. Expansion is inevitable, and Phase Two is likely to concentrate on the cycling heartlands of Belfast to the south and east – if only because the ‘interim’ expansions already announced are primarily to the north and west. What surprised many was the Central Station to Gasworks journey being the most popular, or perhaps it isn’t a surprise given the excellent Laganside pathway. When year one journey data is released to the public it will be a prime tool to evaluate the streets with highest demand for dedicated cycling facilities.